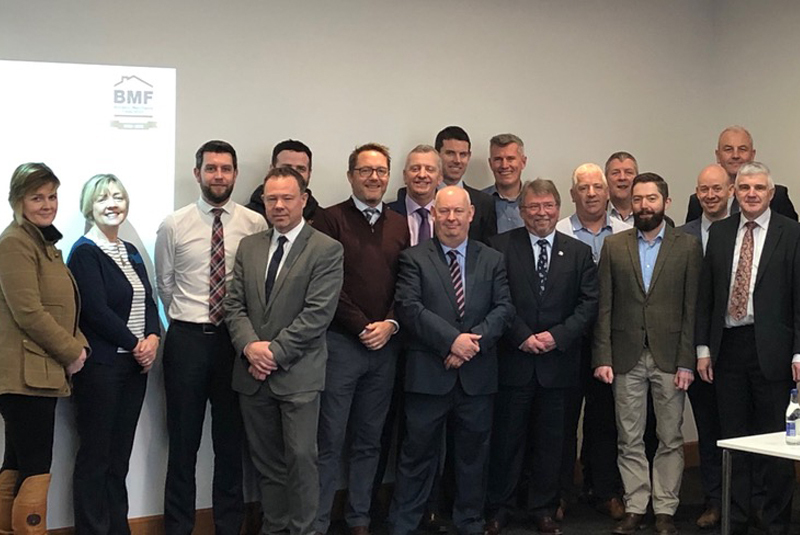 The Builders Merchants Federation (BMF) has held an historic meeting consisting of members from across Ireland, who gathered together for the first time. 24 delegates, representing 12 merchants and several building material suppliers from both the Republic of Ireland and Northern Ireland, attended the meeting at the BMF’s first Regional Centre of Excellence south of the border, at the Xtratherm Innovation Centre in Navan. The meeting was jointly chaired by David Haldane, BMF Regional Chair for Northern Ireland, and Dennis O’Connor, AMBA Chairman. It focused on bringing together merchants and suppliers who share a mutual interest in improving all aspects of their business including improving the customer experience and promoting awareness of the merchant industry, both as a career and to other industries such as architects and engineers. Other key areas of commonality included promotion of Health & Safety and responding to the challenges of on-line and “direct to market” competition, which was followed by a presentation from eCommonsense on digital opportunities. Brexit and the border issue prompted further discussion, with BMF CEO, John Newcomb, providing an update from the BMF’s recent Brexit Forum together with BMF Policy Officer, Brett Amphlett’s key tips on preparing for No Deal.